Happy Monday, Girls and Boys! 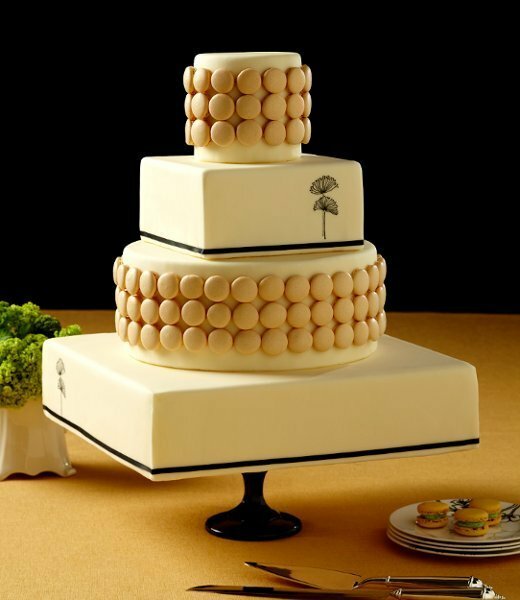 I wanted something a little minimalist today, and I found this lovely cake by Superfine Bakery on Wedding Wire. There is nothing that I don’t love about it. Let’s start with the square-round combination. Isn’t it cool, especially how the middle two layers are about the same size? I love the very sparse detail, too. Some days, I’m just over all the frills and fancy. 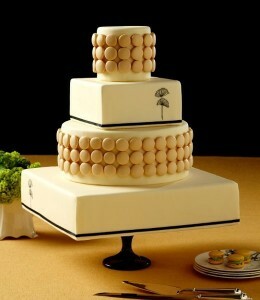 This cake is clean and sparse, and relies on the immaculate execution of tiny details. No covering up faulty fondant work on this one. And I’m happy to see macarons on this cake, too. They were a classic before they were a trend, and I for one am not quite ready to give them up yet. That it’s all balanced like a stiletto heel on a shiny black cake pedestal? Ab. Fab. Macaron Wedding Cake — In Paris!